Well, it’s the end of April, always an exciting time for Peterson fans as the company launches its new product lines. If the brochure I received from Tom Palmer earlier this week is any indication, this is going to be an outstanding year for the company. Peterson is debuting no less than seven new lines, not counting the Pipe of the Year, the Christmas pipe, and the Father’s Day. 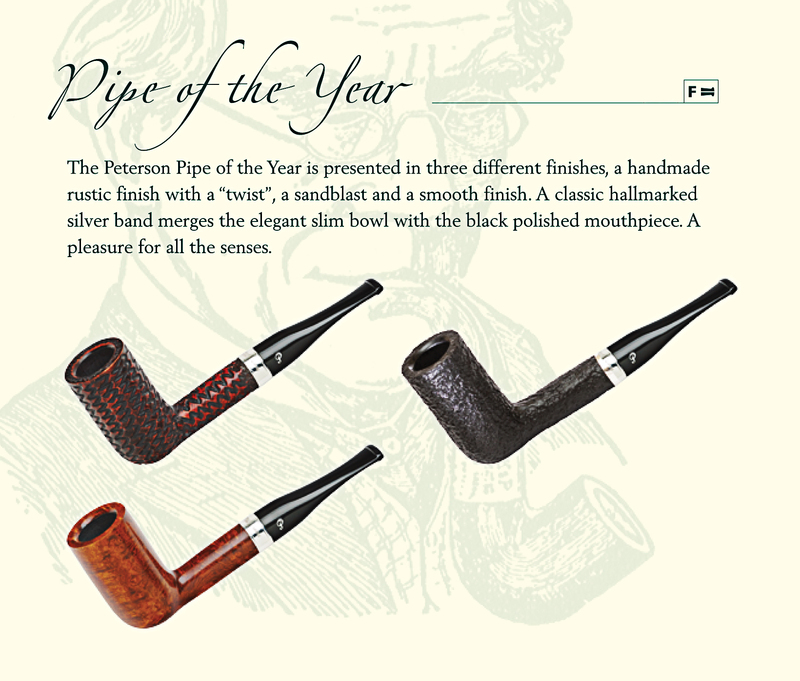 As you look through the new offerings, remember these pipes aren’t out yet, except for a stray Pipe of the Year or two in Ireland, so don’t worry your distributor or pipe shop yet. Just keep an eye out or ear to the ground and they should come over the horizon here in the U.S. by late May or the middle of June, maybe even earlier. As the name would indicate, this is a high-grade new line. It’s got a medium-brown smooth finish and acrylic champagne-colored sterling spigot mouthpiece. The army spigot goes back to the 1906 catalog, as I’m sure you’ve heard me say, but was not re-introduced by Peterson until the late 1970s. If you’re new to the idea of the army (or spigot) pipe, the main thing you need to know is that these are extremely rugged pipes: you can break them down, hot or cold, leaving the stem separated for as long as you like without harming the integrity of the pipe. I’m thinking someone needs to make a small field pouch to carry one around disassembled. Maybe this is something Neil Flancbaum at Smokin’ Holsters could do? 12 shapes. Somewhere I heard that Conor Palmer wanted each year’s POY to be substantially different from the one offered the year before. If true, he certainly made that a reality in the contrast between last year’s 150th Anniversary Founders Edition, an XXL Oom-Paul, and this year’s slender chimney. I’m curious to know if anyone has experience in smoking a straight chimney: how does it compare to a more traditional bowl geometry? Is it difficult to keep lit during the last third of the bowl? In smooth, rustic, and sandblast. Along with the Supreme, the Dublin & London was one of Peterson’s highest grade lines, appearing not long after the London factory opened in 1937. It always featured a gorgeous honey-color stain with a P-Lip and no band. It was discontinued in 1997, but now reappears. 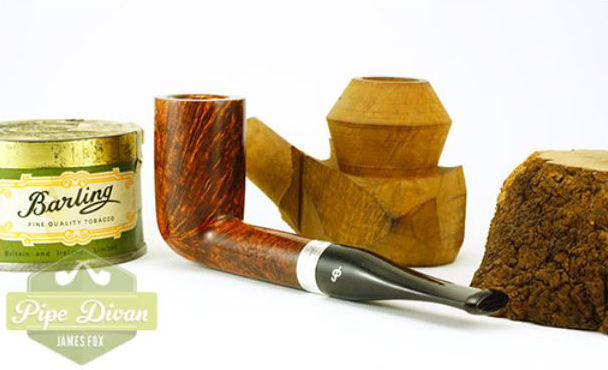 I was just told the Chicagoland Pipe Show—which is next weekend—is the largest show they’ve ever hosted. In fact, neighboring hotels have had to be booked to accommodate everyone who’s coming. 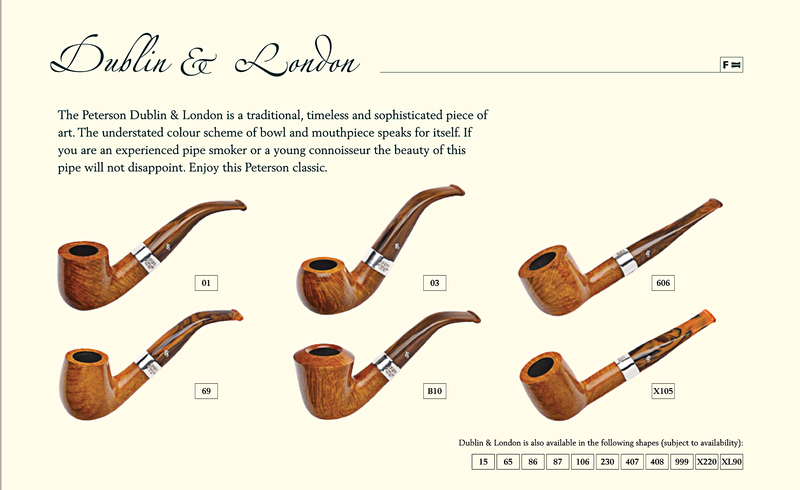 Signs of better times for pipe-smokers, so I’m hoping the “London” part of this line’s name might be prophetic of a renewed enthusiasm for pipe-smoking across the pond as well. Dublin & London is the only line in Peterson’s history with a reversible name: while the London factory was operational (until about 1962), this line, if manufactured in England, was stamped LONDON & DUBLIN. The new version looks to do its older sibling proud: the embedded aluminum P in the caramel-colored acrylic fishtail mouthpiece signifies a superior-grade bowl, and the stain color looks very similar to the original Dublin & London. Elegant. 17 shapes. As you continue your journey through the brochure, you’ll begin to notice ARMY and ACRYLIC are two of the three big words for 2016. 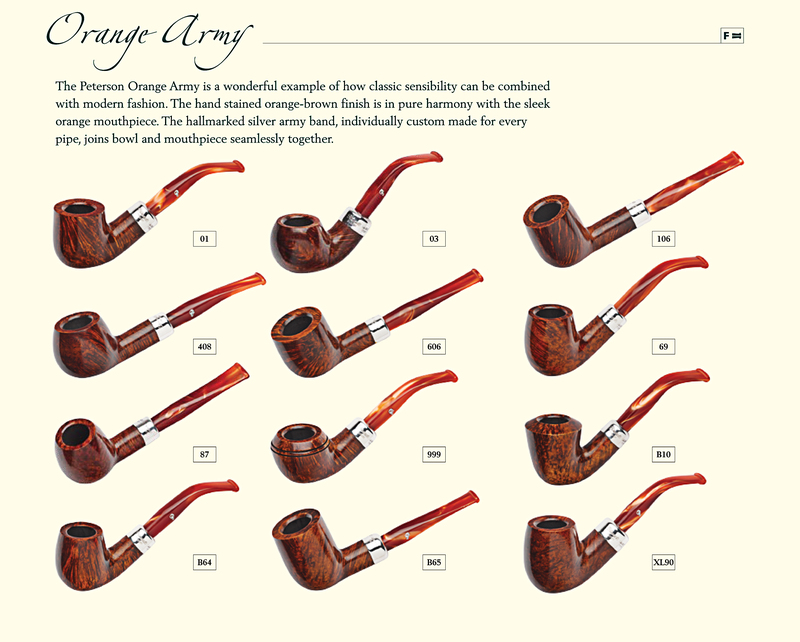 The Orange Army is a mid-point line with sterling ferrule and very good briar. Its orange-brown smooth finish and orange acrylic fishtail mouthpiece rock. 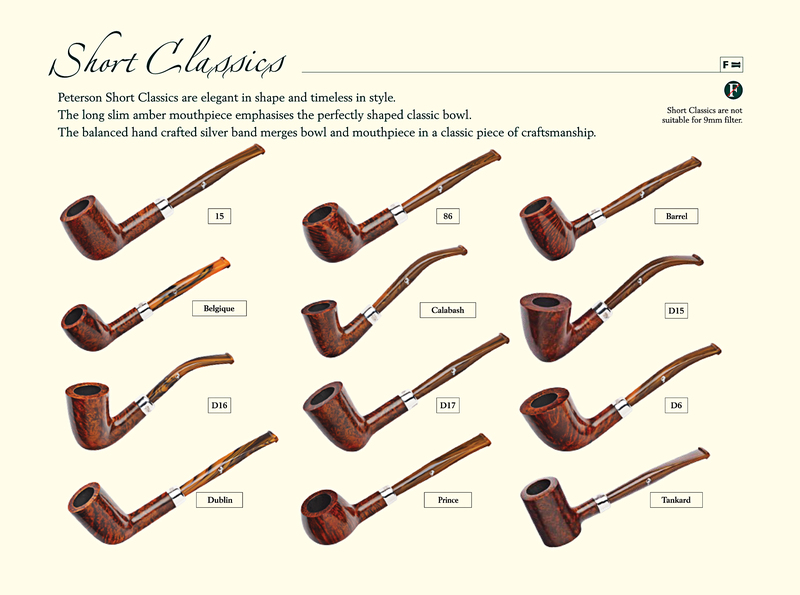 12 shapes, including the B64 bent and B65 straight from 2013’s Antique Reproduction collection. Wow! Here’s something very new and different for Peterson. I’m not talking about the nickel ferrule, the milk chocolate acrylic fishtail mouthpiece with hot foil P stamp, nor the rustication, which we’ve seen on earlier lines. What I’m talking about is the shapes: it’s a massive reintroduction of many of the best Bs of the past 30 years. The Killer B shapes are back—and that’s the third big word for 2016. I’ll let you enjoy perusing the illustration and playing the “Name the Collection Where That Shape Originally Appeared” game. If you can name six of them, I’ll send you a “No Prize” PDF Peterson Tobacco Drying Paper. 25 Shapes. Short Classics is one of those great Peterson design language moments where the past informs and inspires the present. The company pioneered this shaping sensibility back in 1945 with a quartet of pipes: the Belgique & Calabash duo (often called “Lady Pipes” in Europe but used by Flake Smokers everywhere) and the Tankard & Barrel duo, which have all been in constant production ever since. Quite ingeniously to my mind, Peterson has expanded on that idea, adding an additional ten shapes and updating the look with a sterling mount, dark amber-colored acrylic fishtail mouthpiece and hot foil P. Earlier this year we saw the shapes hit the Italian market with a few Kapp Royals and here in the U.S. with the Craftsman line. 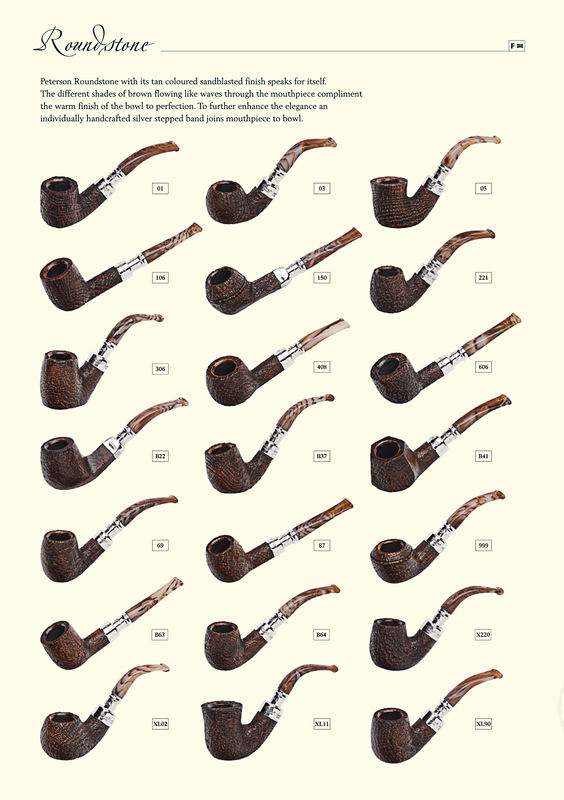 Hidden in the shape chart is one labeled the DUBLIN, which we’ve seen in the Churchwarden line of the past few years but is actually shape 124, one of those archetypal Irish shapes. 1973 is the earliest I can trace it in the K&P catalog, but I wouldn’t be surprised if it was made much earlier in the century, as it was featured in the 1996 Old English Collection. One last remark: the name of the line actually belies the bowl geometries. 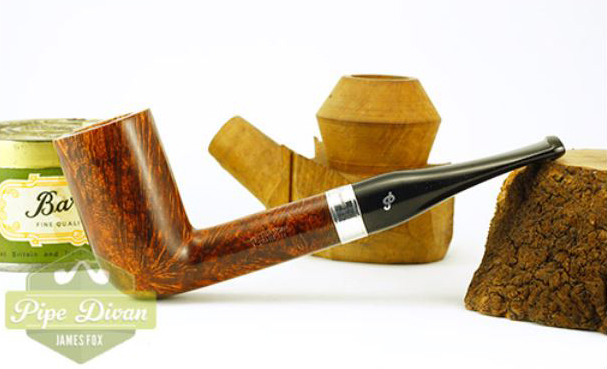 While several of them are smaller, just as many—like the D17—are standard, full-size Peterson bowls. 12 shapes. This is the wild one for me, and fans of the Dracula should love it. It’s got an undeniable beach vibe and should probably be smoked while listening to The Mermen or, for you old dudes, the Beach Boys. Navy stain, nickel mount, yellow acrylic fishtail mouthpiece with hot foil silver P. Surf’s up. 12 shapes. I hope you’ve made it this far through the blog, because the Roundstone is my favorite of all the new lines. First, it’s got a wonderful blast which just might be that I first noticed on the Lubinski Army Linseed line a few years back, brought to perfection in the tan multi-hue stain of the Lubinski Maigret Commemorative. It’s the best blast on a Peterson in a long time, and the stain intensifies the effect. Added to that blast is a sterling spigot mount and tan-and-pearl swirl acrylic mouthpiece, the spigot serving as a kind of visual hinge between the effect of bowl and stem. 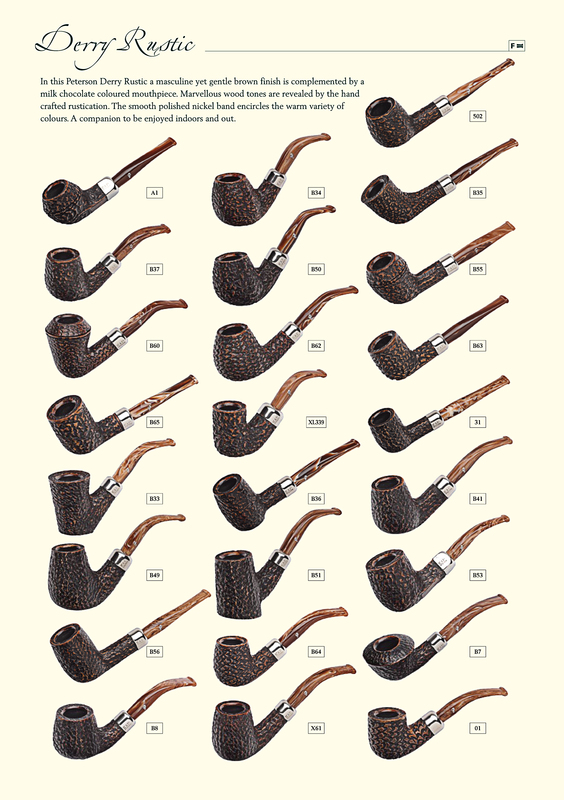 As if this weren’t enough, look at the eclectic range of shapes: there’s some marvelous entries here, and again, if you can name six of the collections where any of them originated, I’ll send you my “No-Prize” Peterson Tobacco Drying Paper PDF. 21 shapes. Back in 2014 (I think) Peterson thought about doing an Army Christmas. If memory serves, they were discouraged by their distributors. Hmm. I guess wiser minds have since prevailed. In any case, we’ve got a very Christmassy warm red smooth bowl with dark green acrylic hot foil P mouthpiece. Look at the great treatment on the XL90 with that shortened stem. Marvelous. No B shapes, but hey, we don’t wanna push our luck here—just happy to see the Army in Elf-Garb, right? I’ll play the guess the B’s game. B60 from the Iceberg collection, x61 was the 140th Charles Petersons pipe, b8 is the amundsen from the great explorers, b50 and b55 from the molley malone collection, b53 from the antique collection. Good enough for a No-Prize! Nice job smirking! I’m very impressed with these new line introductions. I assume they will all also be available with a proper p-lip stem? That blasted Roundstone B69 is calling my name if it had a p-lip! I have had the 2016 POY for several months and she’s a real looker in person. Smokes great all the way to the bottom of the bowl. Nice slender lines. It’s one of my favorite POY’s so far. This is good to hear, Jim. I’m anxious to try one. You made reference to a Father’s day line, but no pics. Are they going to restart the FD line this year? I haven’t heard they were discontinuing it, Justin, but I’ll ask. I did hear today that the POY is not going to be issued as a Limited Edition, in the sense that the pipes will not be numbered! I did hear that there will only be 500 of the smooth produced. Jim, is your POY a smooth? And if so, is it numbered? I heard today there was no “Limited Edition” for the POY this year — no stamp LIMITED EDITION and no sequential number. If this is true, it’s a break from over 20 years of tradition. I’ve never heard it was discontinued but nobody can recall seeing or hearing about one in 2015. Thanks for listening oking into this Mark. My 2016 POY is a smooth. It is stamped and not laser engraved (it appears as though they’ve stopped that for some reason). It is stamped “Limited Edition” and “15 of 500”. This is good news, Jim. Peterson hasn’t completed move to laser stamping, and for the POY, I’m actually glad. This confirms what I heard that there will be the usual stamped / numbered LE pipes, and an unspecified number of POYs in rustic and blast. I’m not a fan of the laser engraving myself. I know it’s a move into the 21st century and all, but I always liked the differing stamps. The variety of them all is great! I, like you Mark, love the 4S, 309, & XL339 (I have a modest collection of them). I’m was excited about your comment regarding their return. I only saw them in the Derry line, however. Will they be returning to normal production line soon? I REALLY hope so! Sadly I didn’t see a single XL 21 in this years line up. I’ve seen more of these in the Kapp Royal line than anywhere else. I’m not surprised they didn’t show up here–they too much at a premium, I’d guess. Wow, look at what we get. colorful stems really are the big thing at the moment, aren’t they? I like the Roundstone and the Derry. Some nice B shapes. Hi Phil! It’s going to be interesting to see how many of the Bs actually hit the market in these collections. I’d suggest if you see one you like, get it when you see it! Just got a smooth POY2016 (59/500) from James Fox. I was told by a veteran piper the chimney shape evolved for Semois tobacco. The sort of brush fire you have on your hands from this single leaf, already dry brick makes sense. He suggested dedicating the chimney to this stuff. I’m going to give the theory a try — Semois, plus LJPeretti’s Cuban Mixture, so all burley. Very interesting about the Semois! I got my POY2016 from James Fox as well — #58/500 — which makes us, what? Brothers-in-Briar? 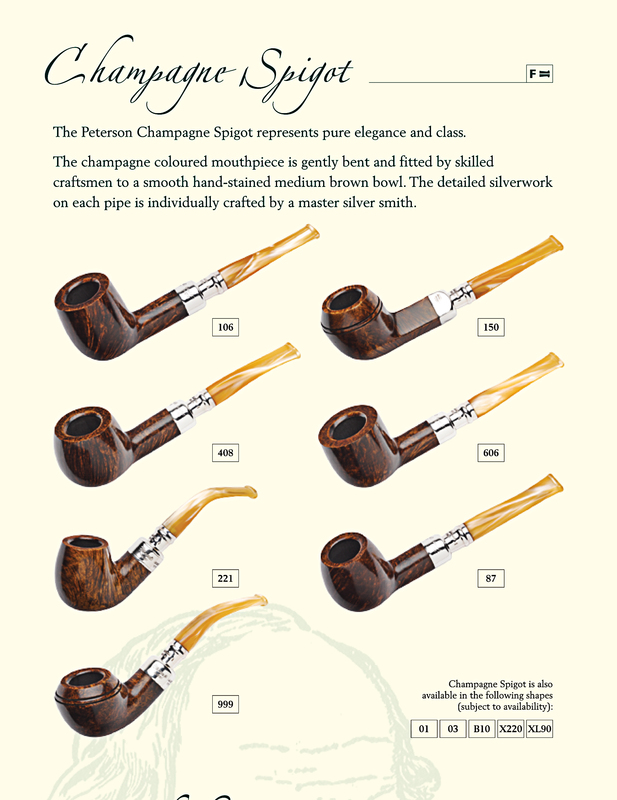 I don’t know how long Semois has been around, but we’ve documented one-off Peterson chimneys back to the mid-20th century — a bent sort-of pickax shape that Dunhill also has in its shape line. So far mine has only accommodated Va, which I find does really well in a tall, thin chamber. Let me know about your experience with the pipe. Thanks so much for the intel! I have thought before about trying this tobacco, and now feel it my bounden duty to do so. 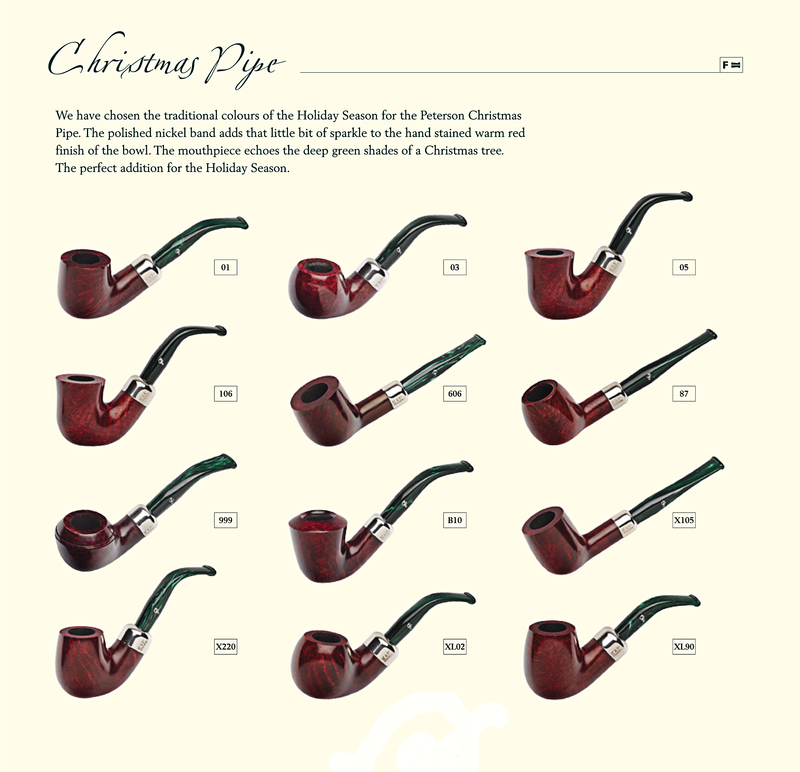 I just got a note from my usual supplier (smokingpipes.com) of the Christmas pipes. None of the pictures show a p-lip. I called and was told that Peterson is not making many p-lips in acrylic. Any idea why? Hi Steven. I’ve been advocating for an acrylic P-Lip for awhile now, and if you send your request straight to Peterson, that will help our cause. The P-Lip is more complicated to make than a fishtail, of course, not only because of the button, but because it has a graduated bore. Peterson made P-Lips out of amber as well as vulcanite until the price of amber went sky-high in the late 1910s and early 1920s. They also made them in horn in the 1930s and 40s. And most recently, the Natural Army Spigot has surfaced in the Italian market with a vulcanite fishtail AND an acrylic P-Lip!! Check it out at AlPascia and Bolittopipes. So it CAN be done. Peterson just needs some urging that their fans want to see it, I think. I was fortunate enough to get one of the Peterson Amber Spigots Shape #87 with a P-Lip from smokingpipes.com. I wanted to point out that this pipe does not have a bone tenon extension, or any tenon extension for that matter. I also have an X220 Amber Spigot with a P-Lip on the way. I can hardly wait to hold it in my hands. Especially now. I want to see if it has the bone tenon. I plan to make a small wooden box lined with green silk/velour/velvet? to keep them together as a set in the style of my 2013 Antique set. 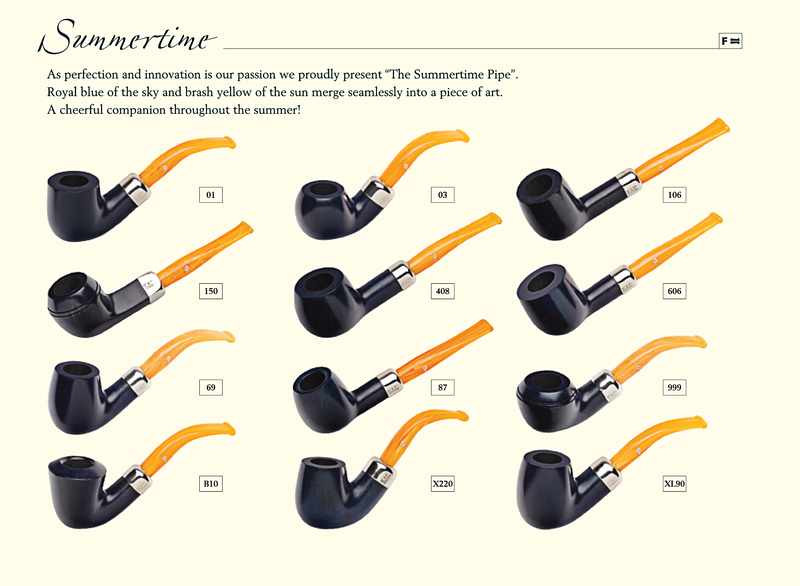 Another idea I have is to contact Peterson to see if I could get a special box like the 2013 Antique set comes in and have them label it as an Amber Spigot set #87 and #X220 just for me 🙂 I might see if they can make some nose-warmer P-Lip Vulcanite spigot stems for each pipe as well. Peterson has been very accommodating in the past with my requests of all sorts. Great people over there at Peterson. I imagine they can accommodate the acrylic spigot stems, not sure what they’re doing with vulcanite P-Lips, as they’re dissatisfied with their source and trying to convert over to acrylic P-Lips (more on that in an upcoming blog). I’ve got my amber spigots in one of those little leather holders that look like upholstered bean-bag chairs that Smokingpipes has available, as I’m afraid to put them in a wooden rack where I might bang the amber.